On horseback, immersed in the uncontaminated nature of Monte Baldo, one of Europe’s most important botanical nature reserves, rediscovering the ancient routes used by herders to move their livestock. 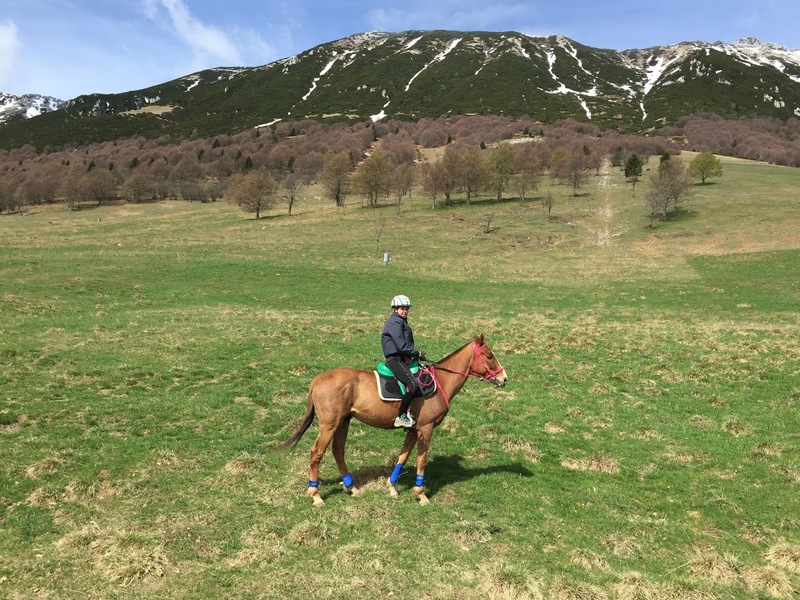 Rhythms from another era, and trails that can be enjoyed to the accompaniment of the music of the horse’s hooves, cooled by gentle mountain breezes as the eyes span the distant horizons. The starting point is Prà Alpesina, and very soon participants must choose between two different routes: the first leads directly to Bocca Navene, while the second veers towards Trattospino (1720) and then to the Malcesine cable-car terminal. 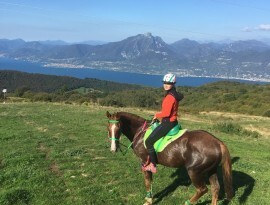 This second route offers a chance to see the breathtaking views of Lake Garda from Baita dei Forti, and is followed by gentle descent towards Bocca Navene. From Bocca Navene (1425), just 3.7 km from the starting-point for the normal route which features a Rest Point, participants can continue towards two eye-catching mountain refuges. The first is the Graziani refuge, with a Rest Point at 6.3 km from the starting-point for the normal route. Further along the winding trail, participants will reach the second mountain refuge near l’Altissimo di Nago: the Damiano Chiesa refuge (2059), which is 9.7 km from the next Rest Point. The trail proceeds towards Malga Campo and then towards San Giacomo, until it reaches the Loc. 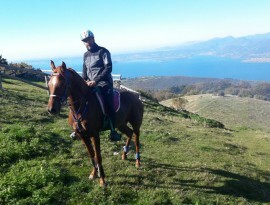 Mosere Rest Point (1270), and then to San Valentino. From here, it returns across the picturesque Prà della Stua artificial lake and back to the starting point at Prà Alpesina. 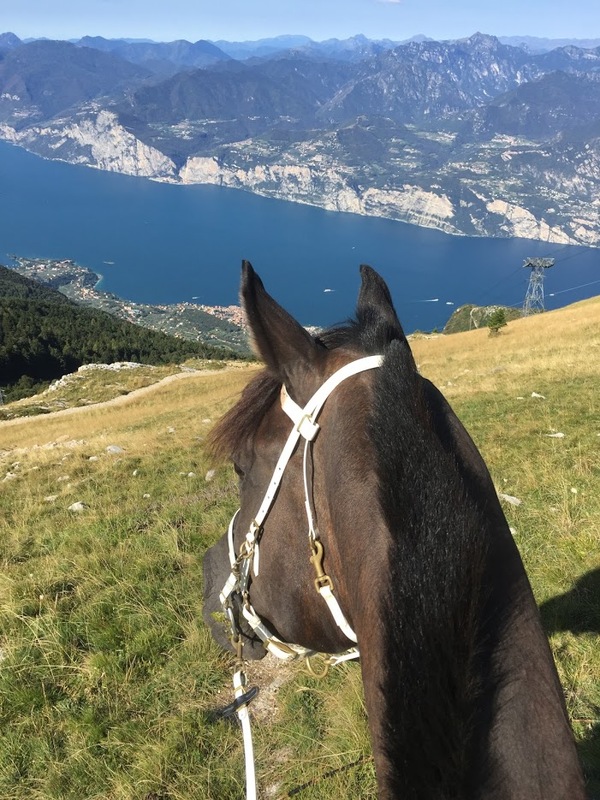 This trail offers a total immersion in the natural beauty surrounding Monte Baldo, passing through breathtaking landscapes from the Brenta Dolomites to the Venice lagoon and numerous Alpine refuges and huts. 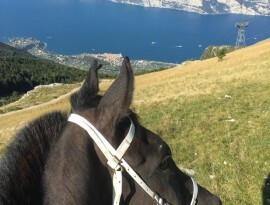 This trail – known as Madonna della Neve, through which it passes – covers two different provinces, starting in the Municipality of Ferrara di Monte Baldo in the Province of Verona (Veneto region), then passing into the Autonomous Trento Province and then back to the original starting point. 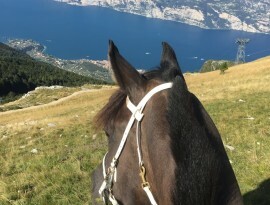 The starting-point, which offers excellent parking facilities for cars and horse-boxes, is in Novezza (1400), and serves as a Rest Point both at the start and the end of the excursion. The route starts northwards at a fairly constant altitude of between 1350 and 1500 m until it reaches Malga Prà Alpesina (1467), then passing through the Malga Acquenere (1382), near a small natural spring, the Malga Artilone (1588), Malga Trembari (1388), finally reaching the first Rest Point (the Prà Alpesina alpine refuge). 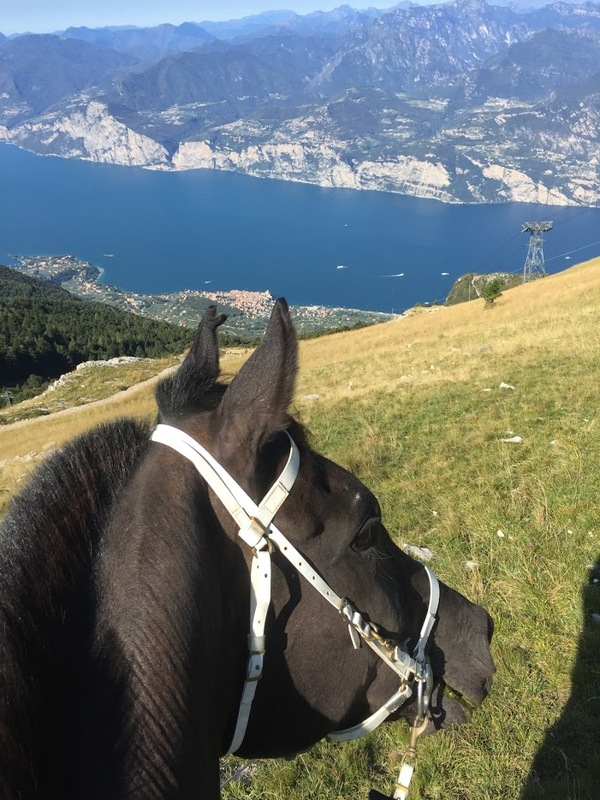 The Monte Baldo mountain range lies to the left for most of the way, and its peaks, some reaching 2200 m, provide a breathtaking view. The slopes are inhabited by chamois deer and marmots, but is is by no means unusual to spot eagles soaring overhead or hear the rustles and grunts of the numerous bears, or see the remains of their prey. This first section comprises about 7 km (7,1) of winding trail. Minimum altitude 984 m. – Maximum altitude 1497 m. Ascent 1118 m. Descent 1129 m.
Minimum altitude 1414 m. – Maximum altitude 1767 m. Ascent 495 m. Descent 534 m.
Participants can choose to take an alternative route which is without doubt worth the effort. A short trail, approximately 3 km in length, brings them to the splendid terminal station of the Malcesine cable-car, famous for its rotating cabins which provide a breathtaking view comprising almost the entire expanse of Italy’s largest lake and even further to the Val Padana in one direction and the Alps in the other. The trail continues towards Bocca di Navene and then back to Malga Prà Alpesina. 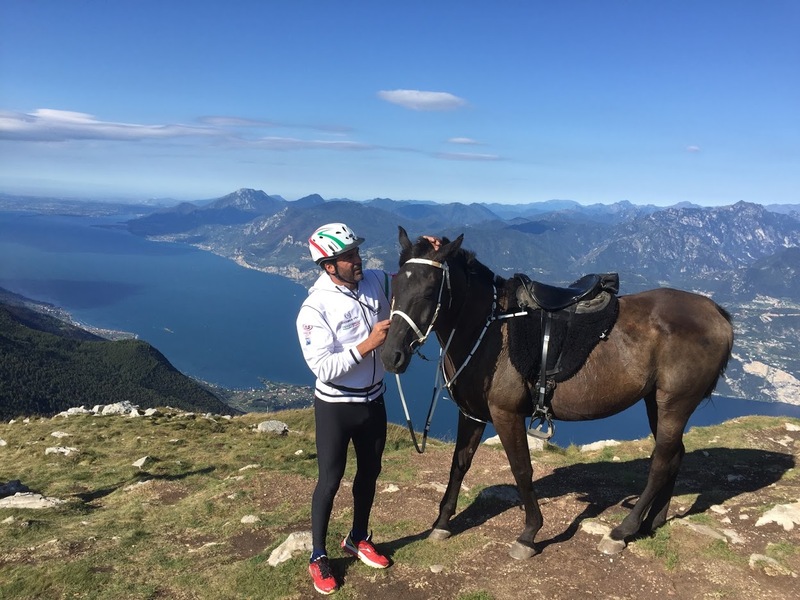 From here, it descends as far as Madonna della Neve (1067), where a welcome Rest Point at the mountain refuge (Monte Baldo) awaits the partipants. The return leg passes through spots where Mother Nature still reigns supreme, between pine woods and rocky ridges, through Malga Trattesoli (1114), the Bivacco Lavacchio refuge (1362), over the Cerbiolo pass (1370) and ending at the Novezza Rest Point, the parking area for the horse-boxes. Trincee di Novezza, the historical border with the Hapsburg Empire. Here, in this frontier area designed to repel possible invasions, participants can see numerous trenches and cave storage deposits from the Great War. But it was here, too, that much of the smuggling between the Kingdom of Italy and the Austrian Empire took place. Novezzina Botanical garden, a few hundred metres below the starting-point, conserves all the plants to be found on Monte Baldo, which has for years been known as the Garden of Europe in recognition of the enormous variety of flowers and plants. The astronomical observatory located near the departure/arrival point, was founded by astronomical enthusiasts from Verona and the surrounding area, and provides an excellent opportunity for evening star-gazers. 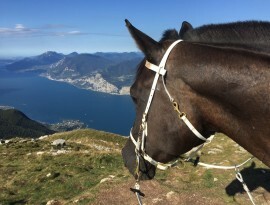 The view of Lake Garda from the arrival point of the cable-car is stunning, certainly not to be missed. The “Malga Ime” trail offers a choice of routes, the first for expert riders and the second, less arduous from the 20 km point, for less experienced riders. Both routes will offer participants the same exhilarating experience. This route starts from Gaon (350 m), a tiny hamlet located north of the municipality of Caprino Veronese. The first section of the route is uphill, followed by a downhill stretch back to the starting-point. 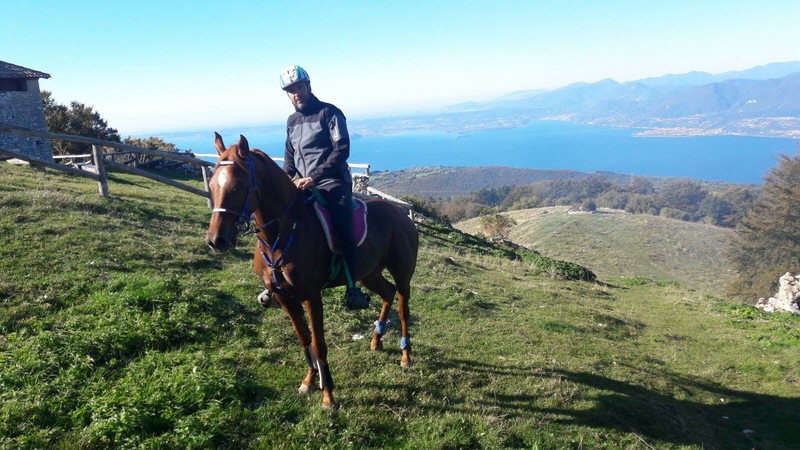 Once the trailers have been parked and the horses saddled, the participants ride north-east towards Lumini (695 m) and from there, after a 6 km ascent, towards Prà Bestemà, with a pause at the first Rest Point (“Il Castagneto”) for the horses and the riders. 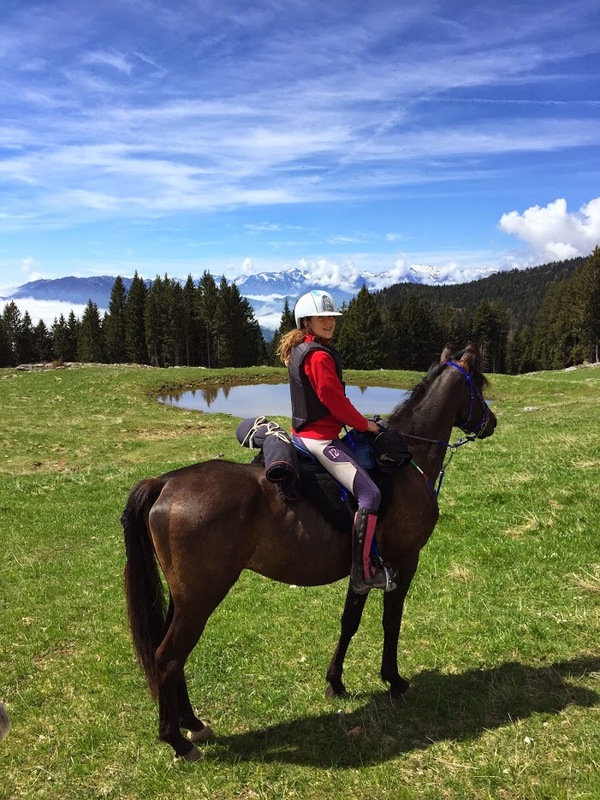 Back in the saddle, the participants ride through Val Zilone until they reach Malga Zilone Alpine refuge (1054) and then on to the Malga Zocchi refuge (1282) and to the Dosso dei Cavalli (1304), a breathtaking spot for riding enthusiasts; from there, a short ride to Malga Colonei di Pesina (1367). From here, riding northwards on a slightly descending trail, we come to Malga Valfredda (1331). At this point, the participants can decide whether to take the normal route or the more difficult route for expert riders. Those opting for the less arduous route will ride directly for about 1 km to the second Rest Point (Malga Ime – 1128), while the more expert riders can opt either to proceed towards the Rest Point or to take a brief detour before returning back along the same trail. Normal route: From Malga Ime towards Malga Basiana (1068) and then to the evocative Sacrario del Baldo. 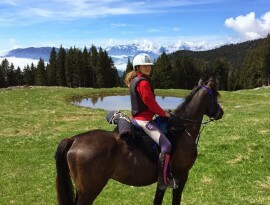 Route for expert riders: from Malga Valfredda the trail runs directly along the same route. Both routes come together in Moie, and then, passing through the Alpine Village to the third Rest Point at 24.7 km from the starting-point. 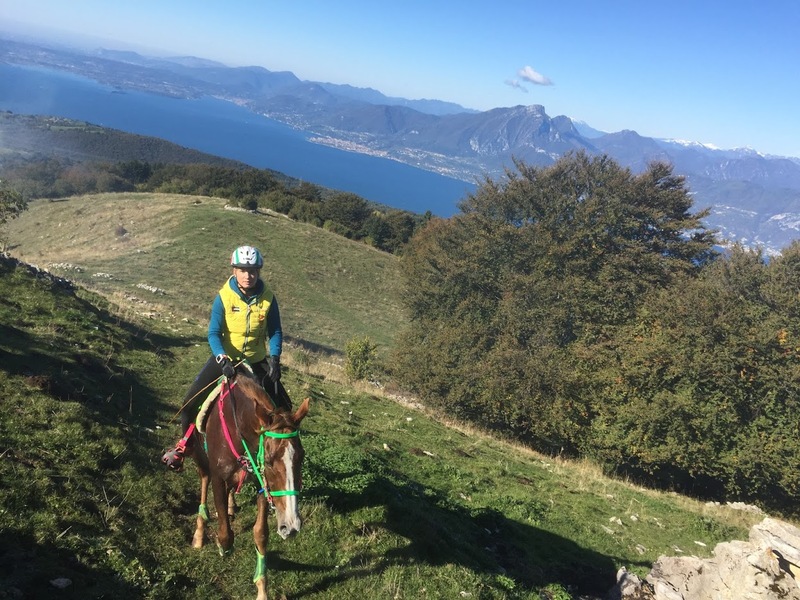 From there, the riders pass to the astronomical observatory in Novezza (1235), after which the trail returns, passing near Cima Gambone (1248), to the village of Ferrara di Monte Baldo, followed by an easy trail which, after a short ascent, leads to Basiana, then descending towards the starting-point (GAON). 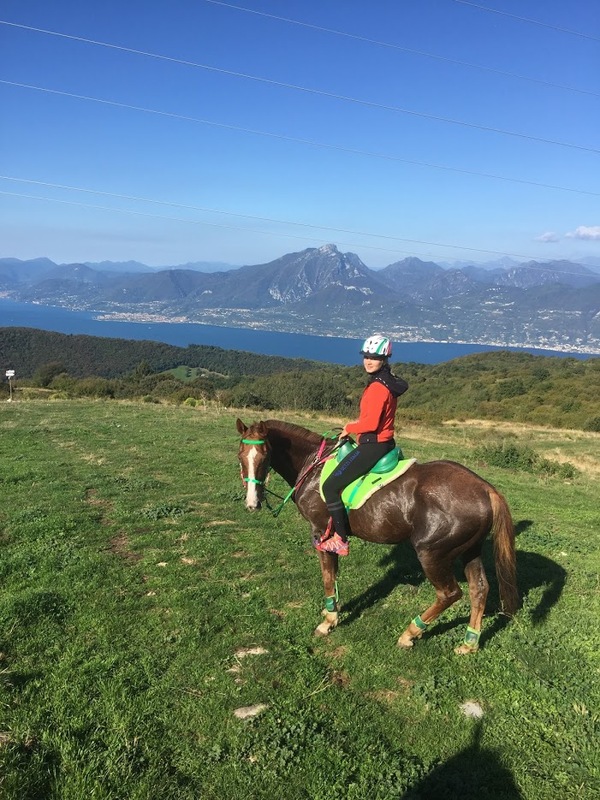 A constantly-changing landscape, from the lower parts of the trail to the upper section where it is possible to observe the tallest peaks of Monte Baldo and the picturesque countryside leading to Lake Garda. 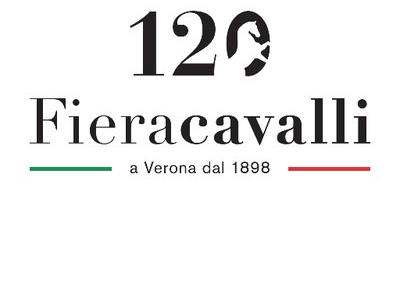 The astronomical observatory, founded by astronomical enthusiasts from Verona and the surrounding area, provides an excellent opportunity for evening star-gazers.